Hi everyone, and Merry Christmas! I haven’t blogged in a while, sorry. But I’m in the process of making Pavlova Minis and I had to share. These little bites are delicious! Pavlova is an Australian/New Zealand dessert, named after the ballerina, Anna Pavlova, who performed so beautifully for the government at the time, they had the head chef whip up a dessert in her honor. Usually Pavlova is a cake topped with whipped cream and various fruits, but these little diddys are far more manageable. 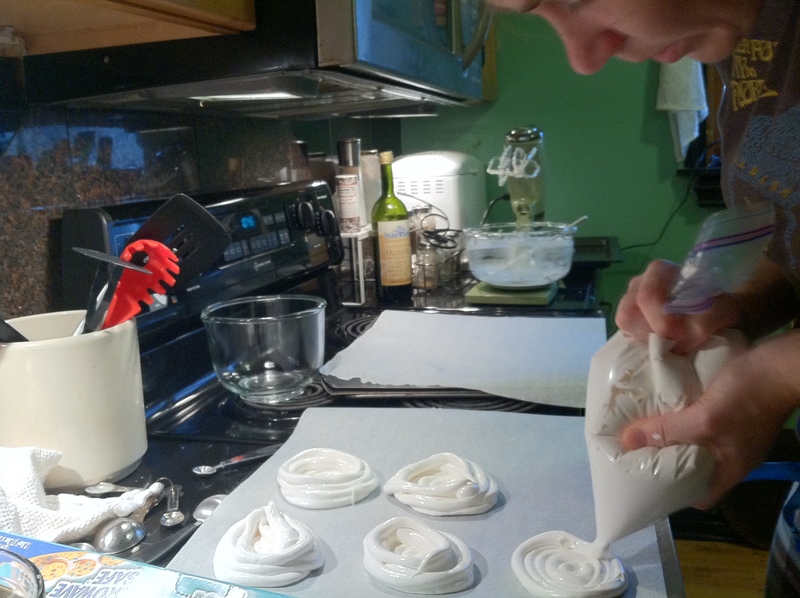 Here’s me using my neighbor’s retro-fabulous stand mixer (I borrowed it after my crappy $10 hand mixer broke mid-whip)…note the bowl is turning. Mesmerizing. 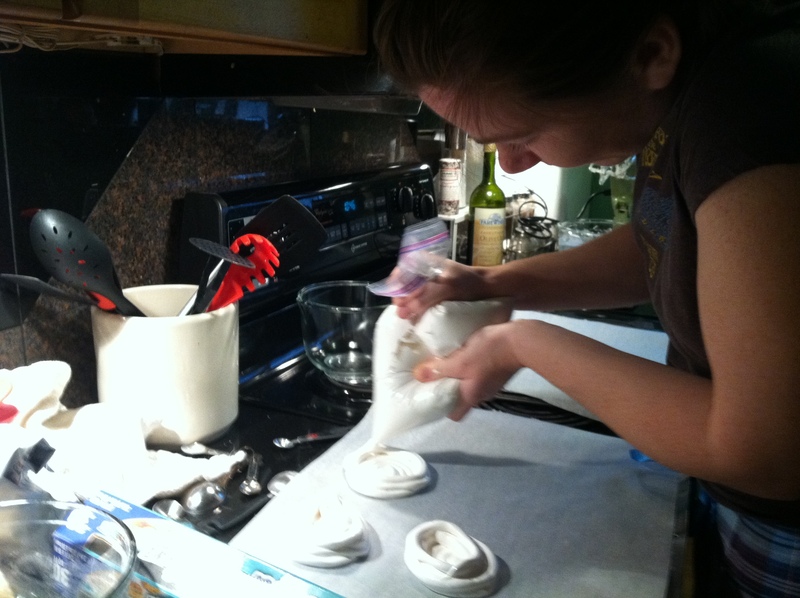 …And here’s me using a zippy to pipe out the Pavlova Minis – once these are baked and cooled, I’ll fill them with chopped up fruit and cool whip. YUMMO! Protip: Ensure all your bowls and kitchen utensils are very clean and dry. This recipe is about purity, so you don’t want the remnants of last night’s cheddar scones screwing things up. 1. Preheat oven to 275 degrees Fahrenheit. 2. line baking tray with parchment paper. 3. In a small bowl stir cornstarch in with sugar. 4. 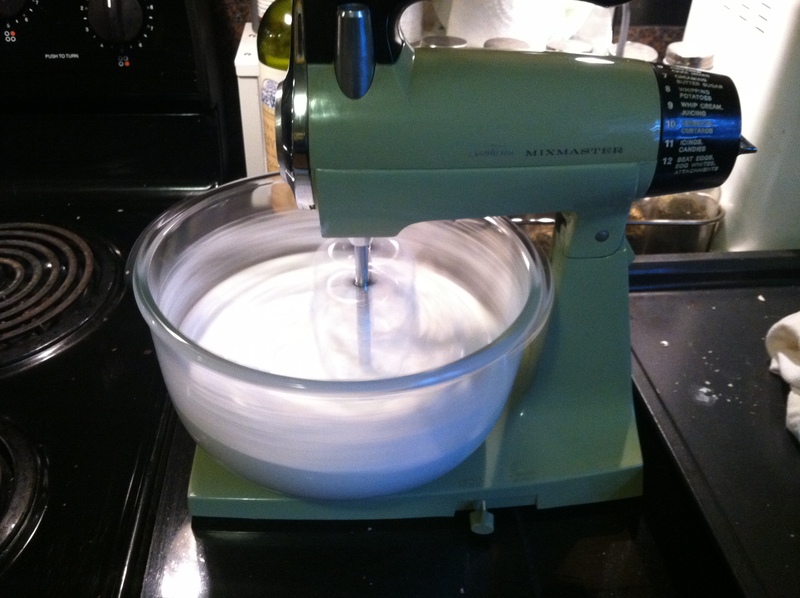 In a large mixing bowl, whip egg whites with cream of tartar, vanilla and salt. Whip on low speed for 2-3 minutes until soft peaks form and bubbles are small and uniform. 5. Increase speed to medium & gradually add in sugar/cornstarch mix spoonful by spoonful. 6. Once all ingredients are mixed together increase whisk speed to high and whip for 4-5 minutes until mix is glossy and stiff peaks form. 7. Pipe or spoon mix into rounds (see picture above – I use a large zippy as a pipe and slice off a corner so the opening is about 1 centimeter in diameter). If you spoon the mixture into dollops on the parchment paper, use the back of a spoon to create an indent in the center of each dollop for toppings. 8. Reduce oven temp to 250 degrees Fahrenheit & add trays to oven. 9. Bake for 50-60 minutes or until Minis are crisp and completely dry to the touch. DO NOT OPEN THE OVEN AT ANY TIME DURING THE BAKE. 10. Remove from oven and carefully transfer to a cooling rack. Minis will break easily if you’re not careful. PROTIP: Use a wide spatula and check the underside of each Mini. If it’s squishy put it back in the oven for 5-10 minutes until it’s baked dry. 11. Minis will stay fresh in a sealed Tupperware container for up to 5 days at room temp. (don’t keep them in the fridge), so I find it easiest to bake these the day or 2 before I need them, then I just top them with whipped cream & fruit when it’s dessert time. NOM. I hope your Christmas is filled with as much nomtastic food as mine will be!